← Friday, February 13, 2015 Chicken Friday? Rather than go out we have decided to cook a nice Valentine’s dinner for each other. 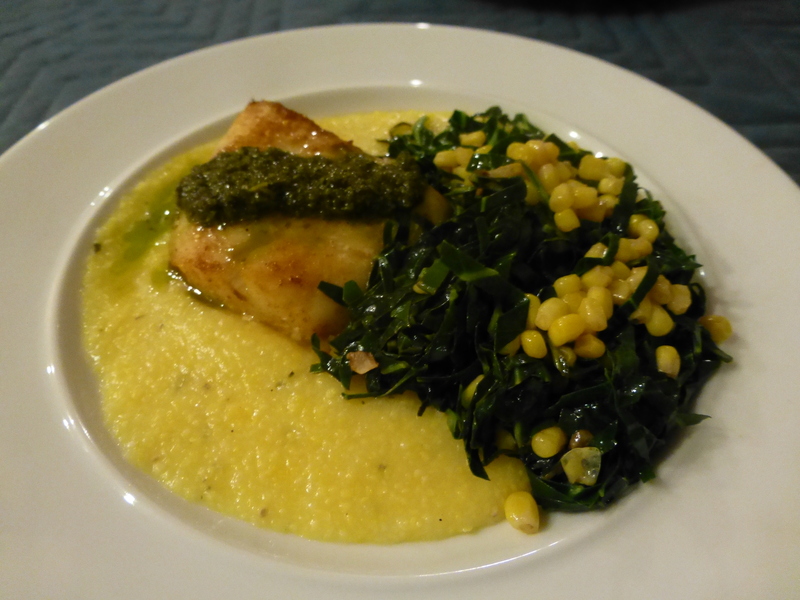 Our dinner of Pacific cod, polenta and collard greens and corn is one we have been working on. We have found a better source of ground corn for the polenta which will help the dish greatly. John makes the polenta in a ratio of one part polenta to five parts water. It comes out soft and creamy. He also bakes the cod in the oven. In the meantime I make the parsley sauce for the fish and chiffonade the collard greens. Before cooking the greens I saute some sliced garlic and the corn. I’ll add it back in when the collards are cooked. In no time at all dinner is ready. We open a good bottle of Chardonnay and toast each other! Happy Valentine’s Day! This entry was posted in Fish and tagged collard greens, corn, diet, Pacific cod, polenta. Bookmark the permalink.